Educational Qualification: Candidates should possess First class M.E/ M.Tech./ M.S. or equivalent for SRF, First class B.E/ B.Tech/ M.Sc. or equivalent for JRF with relevant experience. How to Apply: Eligible candidates may send their application in prescribed format along with duly supported by attested copies of educational qualifications, experience, etc., relevant documents & in an envelope should be superscribed as “Application for the post of____________” (name of the post applied for) by ordinary post only reach to the Director-ARCI, Post Box No. 312, Hyderabad GPO, Hyderabad–500 001, Telangana, India or mail to rectt@ardi.res.in on or before 09-08-2016. Last Date for Receipt of Application: 09-08-2016. 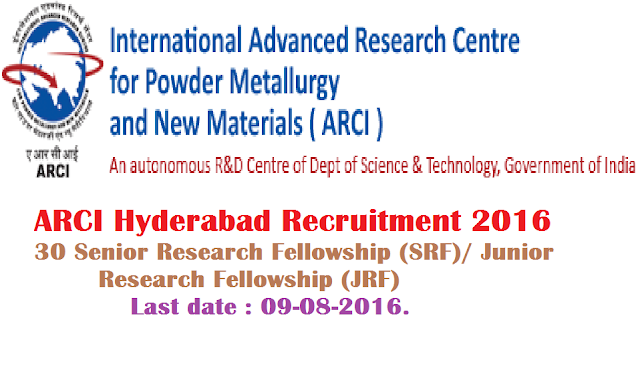 Date & Venue of Selection for Interview: September/ October 2016 at Hyderabad.